We welcome you for your holidays in the heart of a Breton farmhouse in a former stone stable (terraced side) equipped with a wooden terrace and garden, private parking, fully renovated in 2012! A backdrop of stone and painted wood for a gentle and quiet stay near the sea. It has all the amenities (good bedding, fully equipped kitchen, flat screen HD, DVD player, garden furniture, high-speed WIFI, barbecue ...). The beaches and lakes are within walking or cycling from the farmhouse by a small path. The small fishing port of Pointe de Trévignon is located 1 km from the cottage, accessible by a footpath, you can walk there and buy fresh fish and seafood. For lovers of hiking or biking, you can start your tour of several hours between the sea and countryside from the farmhouse. During your tour you will discover protected natural sites, the famous thatched cottages Stone Standing chaos of rocks and numerous streams in a quiet and privileged !! 15min by car, you can explore the town of Concarneau, its walled town, its large fishing port and marina, its restaurants and its large market on Friday !!! A 15 min drive also lies the town of Pont Aven, famous for its cakes with salted butter but also its many art galleries. The fishing port of Trévignon Pointe is located 1 km from the farmhouse, accessible by a small pedestrian path you can walk there and buy fresh fish and seafood. You can also go up lobster traps to Glenan with a fisherman friend who will show you this extraordinary archipelago !! The situation of this property is excellent...no sea view, but just 10 minutes walk through dunes to a fabulous coast. The village and port is just 15 minutes or so away. The property itself is fine for two people, but not really for 4, unless two of them are young children. The breakfast bar works well for two, but it would have been better to have a small dining room table. Casual seating is fine for three people, but a comfortable chair for a fourth person is needed. 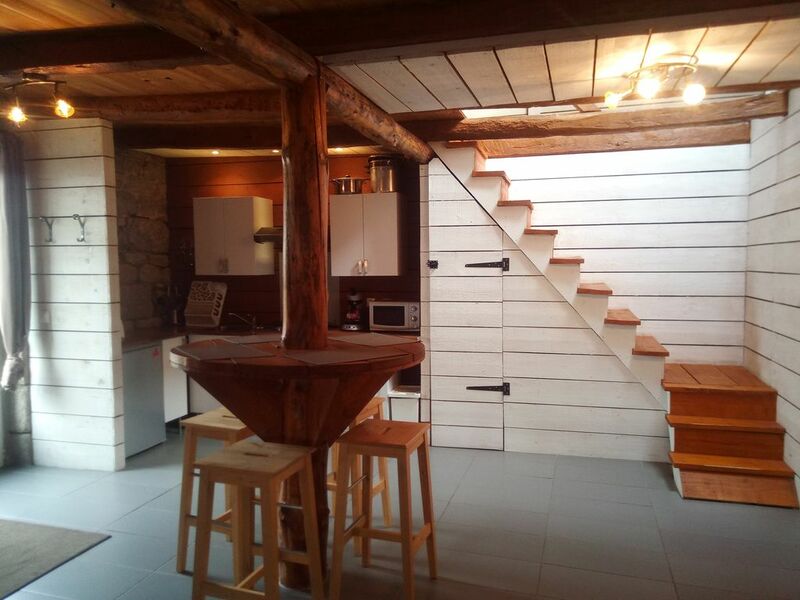 A charming, rustic, conversion of a barn, inevitably it is rather dark inside, but, if you want to find a base for walking and discovering this wonderful area, you might find it hard to beat this property. Très agréable maisonnette, le bois partout et le poêle apporte une atmosphère chaleureuse. La proximité des plages, et du port de Trévignon sont des points très positifs pour cette location.